The Gospel of Sri Ramakrishna as translated by Swami Nikhilananda offers the reader a penetrating view into the spiritual wisdom of India. On account of his deep mystical experiences and constant absorption in God, Sri Ramakrishna (1836 – 1886) is regarded as being of the stature of Krishna, Buddha, and Christ. The Gospel is the record of Sri Ramakrishna’s conversations, which are unique in their breadth and depth. Profound spiritual truths are described in simple words and vivid stories, revealing the divinity of man and the spiritual foundation of the universe. This volume is a mine of inspiration, wisdom, theology, and metaphysics. 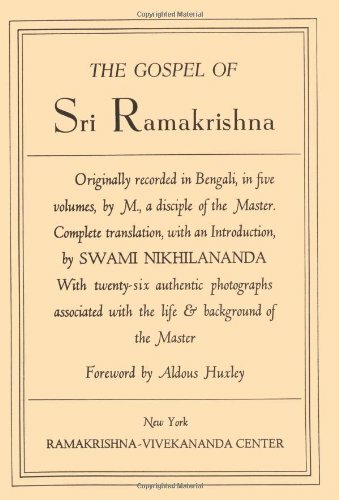 This 1106 page volume contains an introduction (70 pages) by Swami Nikhilananda that narrates the main events of Sri Ramakrishna’s life and briefly sketches the people and the doctrines associated with him. Also, includes 26 photographs, a detailed glossary, and an index.